On the day of the Feast of the Intercession of the Blessed Virgin Mary, after the Hierarchical Divine Liturgy at the Procathedral of St. Sophia in Rome, the Head of the UGCC presented the patriarchal letters to Fr. Marko Semegen, the president of the Society of St. Sophia and the rector of the cathedral, and Alessandro Priorelli, director of the company "Gomena". The Head of the UGCC presented the letter to Fr. Marko Semegen on the occasion of the celebration of the 10th anniversary of his hierarchical consecration. "Your life is full of pastoral sacrifice and devotion to the preaching of the Gospel of our Lord Jesus Christ. By your good deeds for the sake of God's glory and the good of our Church, you have gained a good reputation and respect from those whom you serve for so many years," says the letter of the Head of the UGCC. His Beatitude Sviatoslav thanked Fr. Marko for the years of their cooperation, and his constant readiness to serve the Church, the "Holy Sofia" community and the community of the cathedral. 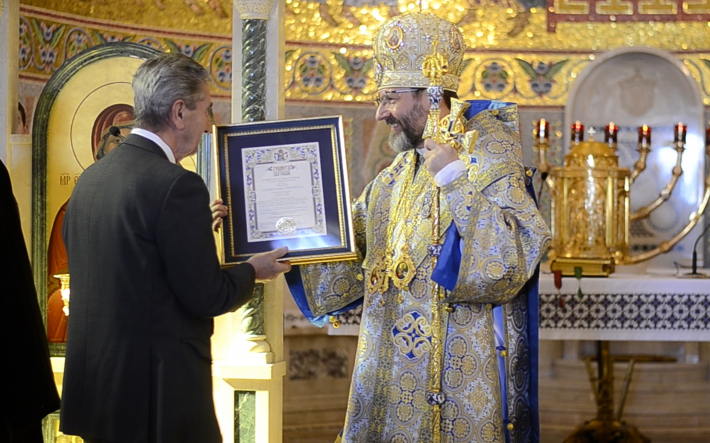 The Italian philanthropist received a distinction from the hands of the Head of the UGCC for his "work for the glory of God and the goodness of the Ukrainian Greek Catholic Church, especially for the generous acts of charity for orphans and refugees who suffered as a result of the war in Ukraine." Mr. Priorelli is the head of the charitable organization "Gomena", located in Perugia, which has been cooperating with the UGCC by the initiative of Cardinal Gualtiero Bassetti, President of the Bishops' Conference of Italy.